Every NYC apartment building, office, dorm and senior center can have a Free Stuff box, making it easy to ‘take’ and ‘leave’ stuff for others. There’s a lot that we as individuals can do to cut down on NYC’s massive trash heaps – like bringing our own reusable coffee cups, water bottles and shopping bags. But there’s even more we can achieve when we join with neighbors right in our own buildings. The black bags that pile up on sidewalks emanate from residential buildings. (Commercial waste is picked up separately.) So, it’s up to us residents! If you’re tired of seeing the mountains of black ‘sausage’ bags on trash night – and sometimes piled even higher with tons of still usable bookcases, chairs, lamps, framed pictures, and everything dumped from Granny’s old kitchen en masse – take these simple steps to reduce waste in NYC this year. You’ll make a difference to our environment and to yours and your neighbors’ quality of life. 1. Encourage neighbors to recycle more. A full 74% of everything New Yorkers throw out is recyclable, but only 17% of that is collected so it can be turned into new stuff. Remind neighbors and friends that recycling bottles, cans, paper, cartons, hangers, and other items is the law! Dispel myths that what winds up on landfills will eventually ‘biodegrade’. Remind the skeptics that what gets set out for recycling by DSNY does find its way to Sims, Pratt and other facilities. Finally, motivate others to reduce waste in NYC by underscoring how recycling saves energy, materials and creates local jobs — in addition to keeping down the trash and traffic associated with transporting waste to upstate and out of state landfills via transfer stations at a cost to the city of $400MM per year. Author Jacquie Ottman kicked off a composting program in her NYC building this year. 2. Collect Food Scraps for Compost. The most important thing any building can do to reduce waste in NYC is get the food scraps out of the chute and into a compost or waste-to-energy stream. That’s because food scraps, plants and other organics represent a third of the waste stream and degrade in landfills into a greenhouse gas that 25 times more potent than carbon dioxide. For this reason, diverting food scraps is high on the Mayor’s list of things to keep down the carbon. If you live in a building with 10+ units, you can start collecting food scraps right in your building and help to build healthy soil via composting. Get the details HERE. 3. Recycle E-Waste – It’s against the law in NY State to throw used electronics in the trash. Representing just one percent of everything we throw out, TVs, computers, cellphones and other e-waste contain heavy metals, making it the most hazardous component of overall waste. Some local retailers collect ‘e-waste’, and the Lower East Side Ecology Center conducts neighborhood drop-off events. But it’s even more convenient to work with the city to get a free ‘E-Cycle’ cage that lets residents in buildings of 10+ units to conveniently drop-off items to recycle right in lobby, garage or other public space. Learn more HERE. 4. Give Clothes a New Home – Stuffed inside those black trash bags are a whopping 200,000 tons of still usable clothing, towels, blankets, shoes and other textiles and apparel. To make it easier for apartment dwellers to capture this waste, DSNY partners with HousingWorks to collect reusable and recyclable clothing and textiles right in 10+ unit buildings. Get more info about the RefashioNYC program HERE. in your laundry, or explore high tech alternatives like the Marketplace feature on one’s own electronic “BuildingLink” platform. Alternatively, search at this DonateNYC site to find vendors and charities who will take them. 6. Free Books and Lots of Other Stuff – Who doesn’t love getting free stuff? Books, knick-knacks, kitchen and stationery items lend themselves to easy pass-along. Create a FREE STUFF box for your laundry or other public space by simply repurposing a carton or other container and watch your neighbors immediately and happily start to ‘leave stuff’ and ‘take stuff’ for others. Create a FREE BOOK EXCHANGE. Even if it’s just one shelf in a building’s laundry or lobby, more NYC buildings than you can imagine have a little free library. Start one in your own building by repurposing a used bookcase — and discover the thrill of finding an unexpected title at just the right price. 7. Swap Don’t Shop – Organize a clothes, food, or kitchen swap with neighbors and friends in your lobby or on your block. Attend a free community Stop ‘n’ Swap reuse event in your neighborhood — and leave stuff and get stuff — all for free. Contact Grow NYC to learn how. 8. Repair Broken Stuff – With repair shops rapidly disappearing due to high rents, spread the word that fixing is getting easier in NYC with the help of pop-up type shops like Fixers Collective and FixUp (formerly Popup Repair), with even more locations in more boroughs. Got tinkerers in your building? Folks who love to sew and willing to teach others? Host a Repair Café in your lobby or community room — learn how HERE — and spread the word that IFixit videos can help anyone fix just about anything. 9. Junk Mail – Still getting too much junk mail? Make the call now to save trees and paper by getting off the lists. HERE’S HOW. Post a sign in your mailroom encouraging neighbors to do the same. 10. Share and Share a Like – Every other Friday a.m., my neighbor knocks on my door to borrow the vacuum. 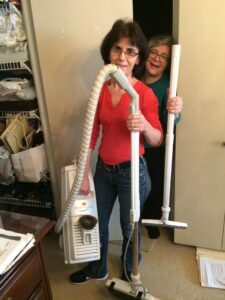 With space so tight in NYC apartments, why not share vacuum cleaners — as well as irons and ironing boards, fondue pots and more? While you’re at it, start an Umbrella Share in your lobby. Do you really need a wet umbrella in your apartment? What gets measured gets managed. In addition to tracking what we buy new (if we track it at all), and what percent we recycle, consider other measures of living more sustainably here in the City, especially in high rise apartments. How about keeping tabs on the percent of our consumption that represents items that we acquired as used rather than buying new? How about being conscious of making what we do buy last a long time by buying quality in the first place, keeping items in good condition, and repairing them when they break? are shared with others as you can. And finally, be conscious of how connected you are to the neighbors. How many of your own neighbors right on the corridor of your own building do you interact with on a weekly or monthly basis? What senior or single person can’t use more friends? What parent someone to watch the kids in a pinch? 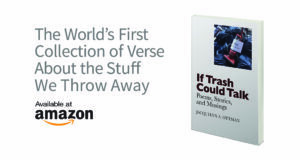 Posting Guidelines – This and other stories published on WeHateToWaste.com are intended to prompt positive conversations about practical solutions for preventing waste. Opinions expressed are solely those of the contributors, and WeHateToWaste implies no endorsement of any products or organizations mentioned. Thanks to Lillibeth Liriano for contributing to this post. I love this list! Everything listed is easy to do and truly generates an impact. Imagine if everyone in NYC adopted these ten practices? So much waste would be reduced and prevented. 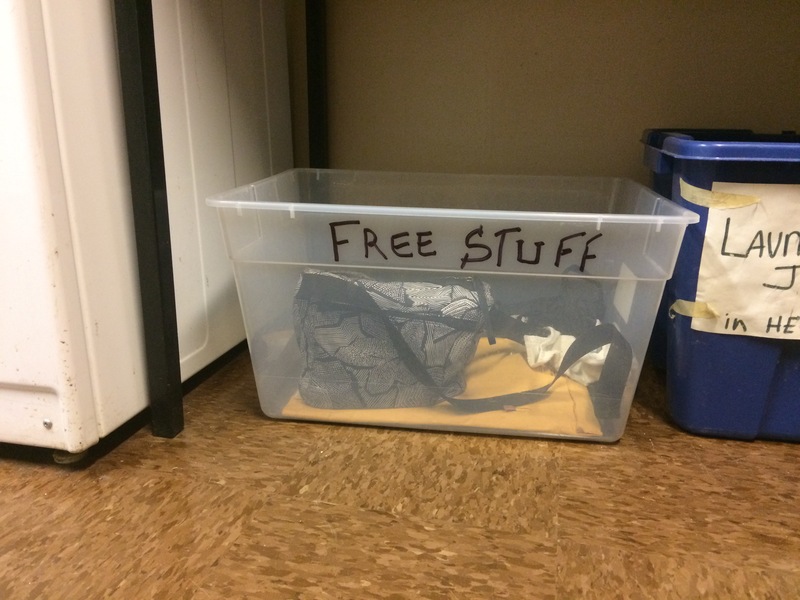 I’m hoping to find a spot in my building to introduce a “Free Stuff” box this year. It’s such a great idea! The mention of e-waste reminded me of the importance of properly disposing of electronics. It’s easy to forget about the dangers of heavy metals, but as electronics are increasingly prevalent, it becomes increasingly important to pay attention to e-waste. I wonder how college campuses can encourage proper e-waste disposal. I’ve actually been toying with the idea of putting a box in the lobby of my apartment for all the excess clothing items I’ve been meaning to donate. But, I hesitated to do so because I wasn’t sure if my neighbors would trust that someone would give away good free clothes like that. Any tips for how to start this, especially in an apartment building that doesn’t have a strong neighbor-to-neighbor bond? This article is great for day to day living in NYC apartments and is actually applicable to many of us living in dorms in NYC as well. Students can make a huge impact on waste reduction in their dorms by going to their universities to implement ideas found on this list. Right now, many university dorms struggle to do anything sustainable/ waste reducing other than recycling and I believe it is imperative for students to take the initiative to remedy this. As someone who is attempting to reduce personal waste & just moved into their first apartment, I found these tips to be very helpful! I wish all buildings had mandatory compost drop-offs to ensure organic matter didn’t end up in landfills. 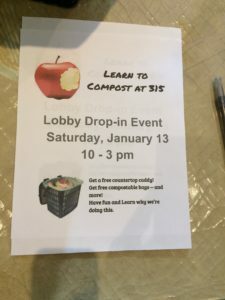 I’d love to get a large-scale compost initiative started in my building & am going to take steps to figure out how to do this! Thanks for the inspiration. These are such easy and convenient tips and truly inspiring! I hope to take this to the next step, and make this a platform for community building not only in apartments but also in residential areas consisting of houses. Household members can come together and have communal events in the nearest park or garage and encourage the youth to be engaged and active in such activities. The future is in the hands of the this AND the next generation! Love these ideas! I would never have thought to share a vacuum with a neighbor, but it makes so much sense given the infrequency of use. I definitely need to do a clothing purge, and there are plenty of people in need who would appreciate them more than I seem to be. I plan on starting an indoor community compost bin in my new place; this way, my neighbors can easily contribute their food scraps without having to maintain the bin themselves. This idea is great. When I moved out of my college home this year, my roommates and I had a ton of leftover household items. We were struggling to figure out how to transfer all of our leftovers to a donation center or shelter. Junk Luggers is an awesome service in Connecticut that “lugs junk” from homes and donates/recycles it. However I think this idea for NYC is particularly nice because it brings communities together. The link for junk luggers is below if anyone wants to check them out. The proper disposal of E-waste is more relevant than ever. I recently bought a phone and genuinely did not have a clue as to how to properly dispose the one I had. I looked up electronic recycling centers online and did not find any within my neighborhood in Oregon. I think people in NYC don’t realize how fortunate they are to have access to environmental initiatives such as E-waste recycling centers. In addition to a lack of emphasis in environmental education at schools, people are just not inclined enough to go the extra mile. This is why educational material like this matters so much! These are some awesome tips! I especially like the idea of a free box, its a great chance to purge clutter without filling up a landfill! I see where Irene is coming from being hesitant to start one in her building. I think starting a box would be the perfect opportunity to get to know your neighbors better. Maybe post a note for a laundry room open box night where people can come with unwanted clutter and exchange things in person. This might break the ice and allow neighbors to exchange more in the future! My favorite thing i have been doing from this list is collecting organic waste for compost! The person who i couldnt have imagined to possibly love the idea more than i did was my mother because she definitely loves not having a smelly trashcan anymore. I love these ideas! I just moved to the city about 2 weeks ago and I still haven’t met a single neighbor! I think these ideas will 1. build a community within my complex 2. of course make these complex more environmentally conscious 3. Make it easier for the super to take out the trash because hopefully there will be so much less of it! Especially smelly trash if we start regularly composting! In my apartment we keep our compost in the freezer to keep from rotting/smelling and bring it to the farmer’s market every weekend! Loved all these tips! Makes me very grateful that I had a stoop growing up. When too many children books crowded the shelves or me and my twin brother had clothes that no longer fit, simply putting it on the stoop would mean they would end up in someone’s hands later that day without a trace. Being born and raised in downtown brooklyn was very convenient with having a goodwill store a block away and a buffalo exchange a five minute walk. As technology grows and develops, online resources will aid in making these efforts easier and more efficient. Having to move multiple times in my four years during college led me and my roommates to find second hand furniture through apps (such as letgo) and facebook groups. Though sometimes living in a city trumps the benefits of apps such as the time my roommates and I helped a stranger we saw on the street move out for a free couch and coffee table. Wow these recommendations are amazing! I personally agree with “Collect Food Scraps for Compost”. I used to live in California, and food grinders are installed everywhere, so I was used to sending down all the food scraps into the sink. But After I moved to New York, I started to question where all these tiny pieces of food scraps will go, and how much water it would require to wash down! I live in a mid-size apartment, and I should really think about recommending a separate garbage bin for food waste! Great list! I think we do everything on your list except refilling the printer ink ( but we have a printer that doesn’t need all the little ink refills either). I can’t think of much that you missed but something we enjoy doing is making envelopes out of old calendars and magazine newspapers and making cards with all sorts of recycled paper products. I love repurposing of all sorts! There’s often a misconception that becoming more environmentally-friendly involves a great deal of effort and major lifestyle changes. This is a great way of showing New Yorkers that taking simple steps like these makes a big difference! New York City is inherently so sustainable through its accessible modes of transport and high population density, making it “greener than blacktop” as remarked by Edward Glaeser. Introducing effortless ways to New Yorkers to make their home even more eco-friendly is an amazing step towards a more sustainable world! Also, I especially love the idea about clothing swaps; whenever my university has one, I go with my friends to enjoy an experience similar to that of thrift shopping– but it’s free! As a vegetarian, I would like to believe that plant-based eating is completely sustainable at every stage of its lifecycle. But highlighting the carbon-intensity of organic food waste is important to addressing this misconception. Also, the idea of “Share and Share a Like” could be really effective when applied to printers. Printers take up a lot of unnecessary space, and not many people actually need to own one. Maybe sharing one with neighbors would actually reduce mindless use and paper waste overall. I like that you suggested having a container to put things that you don’t use anymore and let your neighbors know that they can get anything there if they want to use them. I will share this tip with my sister since she told me that she wants to declutter her house. It appears that her house is full of items that are not useable for her since she tends to hoard from sales. Love clothing swaps! My mom would host them at our house when I was in high school and my college hosted one every month. We would provide wine and make it a fun girls night. Everyone gets sick of their clothes every once in a while, so it’s not hard to convince people to partake anyways! I’d never thought of sharing appliances like vacuums before but now that I live in an apartment building, it makes a lot of sense… those things are expensive too! I have attended swap meets between friends and I have always found it to be a great way to meet other people and get rid of some unwanted stuff without having to throw anything out. I also think the process of sorting through all your stuff helps to change your perception of what you need when you see how much you already have!